The last time Backerjack covered the Modobag, a numerous luggage-turned-transportation projects had already failed before the team behind the Modobag LLC went out to attempt raising $160,000 in 2015. Unfortunately, that Kickstarter ended up being a dud, raising just $21,000 of its original goal. Modobag LLC is back at it again with its Modobag rideable carry-on luggage, this time opting to focus its crowdfunding efforts on a flexible Indiegogo campaign instead. Despite the lukewarm reception the last time around, the product is receiving a much warmer welcome this time. That’s not surprising: At its core, the Modobag is a compelling offering, which is why it’s still pretty much the same bag the team offered last year. It still combines a roomy 2000 cubic inches of interior space with a motor within that can achieve a top speed of eight miles hours per hour with a range of about six miles. (This isn’t Fast and Furious, folks.) It still features dual USB charging ports for devices, a GPRS/GSM tracking mechanism that works with an iOS/Android companion app to never lose the bag, and quick release footpegs for maximum comfort while riding it. Each Modobag is going for $995 and is expected to be shipped January 2017. This time around, Modobag LLC is aiming to raise $50,000, instead of the original $160,000 goal it set last year, by August 20th, 2016. The Modobag is great to get travellers from point A to point B quickly, perfect for travelling situations where time is usually of the essence. Getting a speed of anywhere from five to eight miles per hour in an airport radically transforms what can be quite the hike. The product’s capacity to reach an 80% charge in just 15 minutes sweetens the deal. 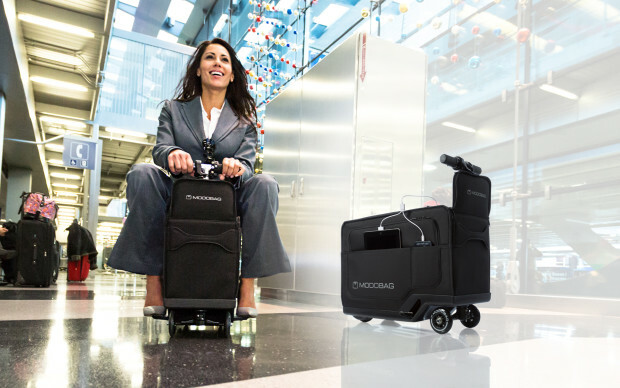 The eFOLDi 3-in-1 folding luggage isn’t exclusively a carry-on luggage and as such, is more versatile in some ways, especially if a user has a lot to carry or if the user is elderly.